Captain, coach, Premiership player and Hall of Fame inductee. In 1933, Carlton Club Secretary Newton Chandler was talking to South Melbourne's champion centre half-forward Laurie Nash, when Nash mentioned that the most skilful opponent he had ever played against was Jim Francis of Hawthorn. Francis was barely tall enough for a key position at 183 cm and 80 kg, but he was athletic, extraordinarily versatile, and a booming right foot kick. The problem was that week after week, Jim was being named as 19th man by the Mayblooms - and he wasn't happy about it. Eventually, as Nash had predicted, Francis’ frustrations came to a head. After playing 61 games over five seasons at Glenferrie, Jim had represented the VFL at the 1933 Sydney Carnival. On his return, he was stunned to find that yet again, he had been relegated to the bench for Hawthorn’s next match. So, frustrated and angry, he walked out of the club and asked for a clearance. Hawthorn refused and countered by suspending him, and a standoff ensued that dragged on for weeks. As soon as he heard the news, Chandler wasted little time in contacting Francis, and soon convinced Jim that he would be more valued, and would get more opportunities at Carlton. Hawthorn flatly rejected the Blues’ first few approaches, but ultimately a deal was done, and Francis became a Bluebagger eight weeks into the 1934 season. Newton Chandler was quoted as claiming that Hawthorn released Francis without a fee – but it seems more than coincidental that Carlton’s accomplished key forward Jack Green transferred to Hawthorn at the very same time. Wearing guernsey number 10, Francis made his debut for Carlton in round 9, 1934, against Footscray at the Western Oval. Playing in the centre, his pace and poise stood out in Carlton’s 24-point win. The following week, he kicked his first goal for the Blues in a heavy defeat by Collingwood, and quite remarkably, was to play another 111 games over six seasons before he kicked another major – in round 8, 1940 against Essendon. Francis’ goal-scoring opportunities dried up for such an extended period because Carlton’s incumbent centre half-back; Gordon Mackie, injured a knee in round 11, 1934 against Essendon. Blues coach Dan Minogue then asked Francis to take on the key defensive post, and the 23 year-old began the phase of his career that would make him a champion. Although he often took on taller opponents, Francis was rarely beaten one on one. He was durable, courageous, and possessed that most prized of defensive qualities; unshakeable concentration. He rarely lost his man, competing just as hard in the last minutes of a game as he did at the opening bounce. Considered the outstanding centre half-back of his generation, he won Carlton’s Best and Fairest award in 1935 (his second season) and was Carlton’s best player in our Semi Final loss to Richmond. He was appointed captain of his adopted club in his third year in 1936, only to relinquish the honour to Ansell Clarke after a promising season ended with another narrow Semi Final loss – this time to Melbourne. Then in 1938, under former South Melbourne star Brighton Diggins as captain-coach, the Navy Blues went all the way and claimed a sixth VFL flag at last, with an emphatic victory over Collingwood. Carlton’s Grand Final half-back line of Bob Chitty, Jim Francis and Frank Anderson was superb all year, and is still considered one of the great half-back combinations in Carlton’s history. Francis won his second Best and Fairest in 1940, as World War II spread throughout Europe and the Middle East. Diggins resigned at the end of that season, and Francis accepted the captaincy again under the coaching of former Richmond Premiership ruckman Percy Bentley. Jim’s career then took another turn when Bentley suggested that his experience would be more valuable as a follower-forward or ruck-rover further up the ground. With Ken Baxter proving an adequate replacement at centre half-back, Francis kicked 45 goals in 41 games over the next three seasons, including a big haul of eight majors in Carlton’s huge win over Collingwood in round 12, 1943. But only a fortnight afterwards, he tore knee ligaments in Carlton’s loss to Essendon at Windy Hill, and was forced into retirement at the age of 32. The second, and more controversial part of Jim Francis’ tenure at Princes Park began when he was appointed coach of the Blues Under 19 squad shortly after his retirement. Throughout six seasons in the post, he proved that he had a gift for bringing the best out of promising youngsters, and was often relied on as an assistant by Bentley. But Jim’s ultimate ambition was always to take charge of his beloved Blues, and in 1956 that dream came true. Regrettably, the period during which Francis coached was one of the least-successful in Carlton’s long history, and came to be called the Dark Years. At the heart of the matter was as the rivalry between Francis and another Carlton great; Ken Hands. The pair had been close friends for years – they lived in the same street, and had helped build each others’ houses. Francis had even been best man at Hands’ wedding, but when Francis was sacked after three dismal seasons and replaced by the equally ambitious Hands, the bitter acrimony that ensued destroyed their relationship. 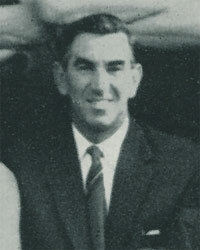 Francis forever afterward believed that his position as coach had been undermined by Hands and his supporters on the club committee, so he left Carlton in 1958 to coach St Kilda for two seasons. His heart was always with the Navy Blues however, and he was eventually coaxed back to the club many years later – although he never spoke to Hands again. In 1996 Jim Francis was inducted into the Carlton Hall of Fame, and for some time afterward was our club’s oldest living player. He passed away at the age of 94 on November 16, 2004, and Blues President Ian Collins summed up the reaction of everybody at Princes Park when he said at the time; "Jim Francis made a magnificent contribution to the Carlton Football Club, on and off the field over many years, and continued to be in contact with the club until his passing. On behalf of everyone at Carlton, we extend our sincere condolences to his family." The Argus of January 24, 1956 wrote about the moves at Carlton to replace Jim Francis as coach. Contributors to this page: PatsFitztrick , molsey , blueycarlton , Bombasheldon , tmd1 , WillowBlue , Jarusa , true_blue24 and admin . Page last modified on Wednesday 16 of January, 2013 23:50:11 AEDT by PatsFitztrick. 1990 Rd 1 - Tom Alvin.